Journey (If Where You’re Going Isn’t Home) is the first book of Max Zimmer’s coming of age trilogy and serves as a solid foundation for what promises to be a superlative series of novels. Zimmer is an exceptionally talented writer and storyteller, and his choice of subject matter is both enterprising and enlightening. Drawing on his own experiences, Zimmer writes here about a boy growing up as a Mormon just outside of Salt Lake City, Utah, in the late 1950s and early 1960s. The details he offers about the often misunderstood Mormon religion are revelatory—insightful yet even-handed, and never preachy. The tone is honest, and the story, as seen through the eyes of Shake, the young narrator, remains realistic throughout. The first part of the trilogy follows Shake from the age of (almost) twelve through fourteen, introducing the influences that form the very core of what Shake is to become, undoubtedly to be further examined in the next two installments. Shake’s life is highly regimented, both by his stern, seriously dysfunctional parents and by the requirements imposed by the Mormon Church. He knows—and is reminded again and again by most of the adults in his life—what is expected of him and acts accordingly. As he enters his teens, however, like many at that age, Shake begins to question all of it. He is hardly a rebel, yet the more he doubts, the harder his parents and his church come down on him. Opponents may call it indoctrination, but the author shows that for a young Mormon boy, it is surely a burden. For some, Zimmer’s descriptions and explanations of the religious rituals in which Shake must take part will be chilling. Zimmer develops Shake’s character so well that readers are certain to feel that they know him. He is alternately funny and serious, wise and childlike, heartbreakingly sad and—very occasionally—so purely happy that his joy seems to glow. 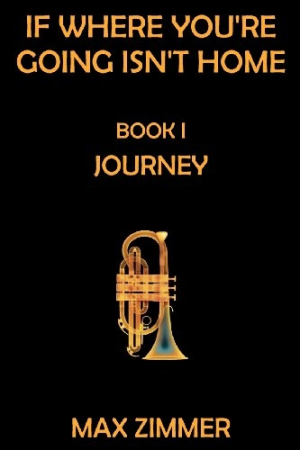 As a budding musician discovering a deep love and true talent for jazz, Shake is introduced by his non-Mormon trumpet instructor to the great legends of the genre. As he comes to admire and respect these musicians, particularly Miles Davis, he is being taught at church that God “had to punish” a rebellious people and “cursed them with a brown skin and made them a loathsome and dirty people.” Can what the Book of Mormon tells him be true? While everyone around him declares “how true they know it is,” Shake ponders and worries. What he is learning and being forced to do in the name of his religion no longer makes sense to him in the context of the rest of his life. Shake’s anguish over the intolerance, bigotry, and hypocrisy surrounding him is nearly palpable, and watching him agonize over his choices is painful. When he realizes that a message implicit in his religious education—“when you get too far from home … you come too close to getting out from underneath its reach”—is not a negative statement but rather a means to answering his questions and finding his own way, Shake’s future is set to change.